If you are reading this, maybe you were caught by the catchy title, or maybe you’ve heard about the Internet Archive Wayback Machine. If you haven’t donated to the Internet Archive Wayback Machine recently, I hope this tale will convince you to support our mutual cause. 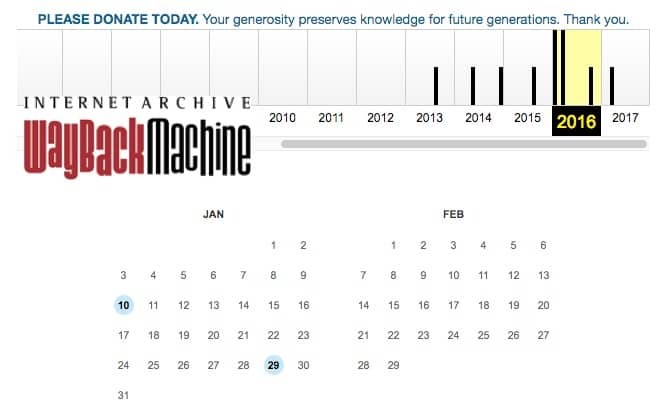 Have you donated to the Internet Archive Wayback Machine? My story began early one Sunday morning, sometime before 7 am. While taking a sip of coffee at my computer—where else would I be—the phone rang unexpectedly. Caller ID said, “Unavailable”. Sadly, 2/3rds of the calls I receive each day are sales, robo calls, or “Can you help me. I think my computer has been hacked…” Hoping against all odds for a new customer call, I picked up the phone that early morning. My business is website security, and this particular caller, from Pakistan, found me in a random Google search. My experience with folks from this region of the world has been markedly poor over the years. Don’t get me wrong. It’s not the people that are the problem, it’s the US Dollar that generally causes “the friction.” That said, this gentleman seemed non-plussed by my flat rate so we continued the conversation in earnest. As it turns out, the hosting company had suspended his website for malware earlier that week, and our new client had been trying in vain to find someone to help in recovering his website. Normally, I find my staff and I can work through the recovery and lockdown of most compromised websites within a few hours. So when he said, “A hacker deleted my website!” I didn’t’ think twice about it. A good percentage of callers exclaim “My website was deleted! Can you help?”. See, all of the images were there, theme and plugins appeared to be in place, albeit most compromised with exploitable code. And other than a relatively common WordPress plugin error displaying on the home page I figured all I would have to do was run a quick WordPress reinstallation, malware removal and then step out to an early lunch. As you may have guessed, that didn’t happen. The moment I logged into the WordPress dashboard my blood ran cold. Indeed, all of the pages, posts, and widgets had been deleted. The hacker had likewise deleted the previously active theme, wryly leaving an old Twenty Twelve theme set as the default. The situation was looking pretty dire at that point. Digressing a bit. The client had earlier mentioned that he was convinced a prior contractor out of Romania was responsible. And he was hoping I could put together enough evidence to prove that was the case. I didn’t have the heart to tell him at the time that it’s virtually impossible to prove guilt in this way. Later I learned the posts and pages had actually been missing for months. 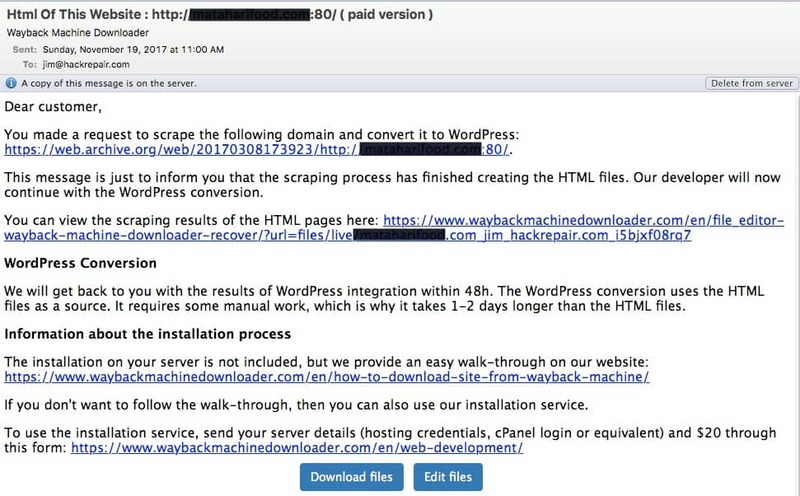 Then, as I delved deeper into the malware review portion of the job, it became obvious that a second hacker had taken advantage of the outdated WordPress version installed just weeks before; which apparently led the hosting company to shut down his account for a terms of service violation (reason: terms of service violation – malware/virus). The moment of truth if there ever was one. I had to decide whether to refund the client’s payment or dive in heads first and figure out a way to recover content that didn’t exist. As it turned out, someone had saved a backup within the account 6 months prior; after the pages and posts had been deleted, but before the WordPress theme had been deleted. I took that as a positive omen that not all was lost. 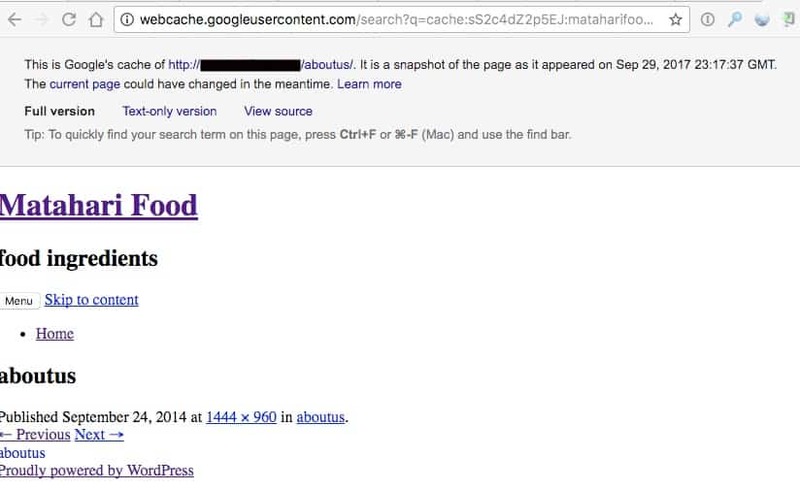 Hopeful, I ran a number of Google searches to see whether any older cached pages existed within Google search. I found a few nicely cached pages. Things were looking up. I then called and discussed with him the possibility of hiring a web designer to recover the lost content using the cached copies from Google. He wasn’t so keen on the idea, knowing that might cost as much as just starting over from scratch. And with Google Chrome’s nice pre-fill in the location bar, I was there with a click and pasted the client’s website address into the Internet Archive Wayback Machine search box. It would seem that in the past year or so the old Wayback Machine appears to have reincarnated itself for the better. So I clicked one of the older calendar links. This brought up the client’s website within the Internet Archive. All of his preexisting pages were intact—in all their original themed glory! His response was overwhelmingly thankful and spilling over with gratitude. He could scarcely believe that anyone could bring his business back online from disaster to rebirth within the span of a few hours. So with a new sense of purpose and the help of the Wayback Machine, I got back to work on recovering the client’s deleted content. Encouraged, I installed a fresh WordPress installation, then reinstalled the preexisting plugins, images, and theme in preparation for importing the cached pages. The Wayback Machine Downloader has no apparent affiliation with the Internet Archive Wayback Machine. But what it does have is a free HTML exporter for up to the first 4 pages found from the Wayback Machine. I was intrigued so tried the free service. Within minutes I had a pretty decent facsimile of the client’s WordPress website converted into HTML only format running on my local computer. At this point it dawned on me that rebuilding the client’s website from an HTML converted format, while doable, was going to take me way longer than the client had been billed for, so I took the chance. I placed the WordPress conversion order. The cost was $50ish US dollars —and waited. The email receipt indicated I may have to wait a few days. Well, within a few hours I found a complete WordPress installation with database and images waiting in my inbox. That was totally unexpected. I figured that at best I would receive a database with some minimal instructions. What I received was a fully ready WordPress website, with better than average instructions on, “How to restore a website from the Web Archive” within a cPanel server setup. 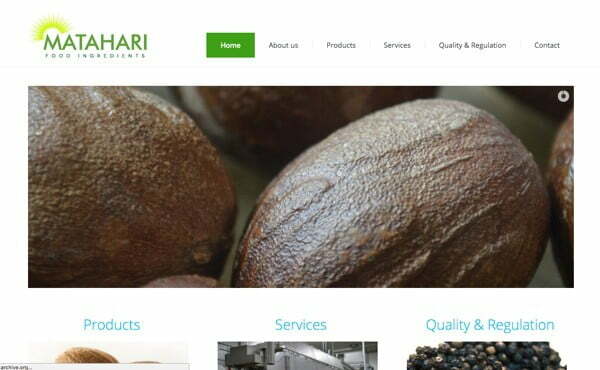 Within minutes I had completed the recovery of database and provided files and had a fully functional nearly identical WordPress ready website in place for my new client. Of course, the Wayback Machine has no way of carting over the previously working contact forms scripting, so some additional setup was required; nothing anyone with a modicum of WordPress experience couldn’t do in a heartbeat. Presenting my client something from nothing within the course of a few hours on a Sunday morning was glorious. The client was so overwhelmed and forthcoming with gratitude that I was floating on a cloud for the rest of the day. It’s days like those that remind me how wonderful the Internet can be and how thankful I am for what it gives us. People helping people—the speed of light is our only limitation. Disclaimer: The writer of this article has no relation to either the Internet Archive Wayback Machine or the Wayback Machine Downloader. No monies were paid or given for the writing of this article. Special thanks to Corey Kretsinger for some much-needed editorial review. Thank you!